I could not agree more I have always believed judging by looks is lazy and shallow, there is always a story behind the face. Trading on looks alone is short lived, a quick fix. You are far more likely to create a positive lasting impression being intelligent, witty, caring, thoughtful and inspiring. If you are in the ‘attractive’ category, great, but to have ‘form and function’, beauty with meaning would surely be a step forward for the media, if not harder to attain. 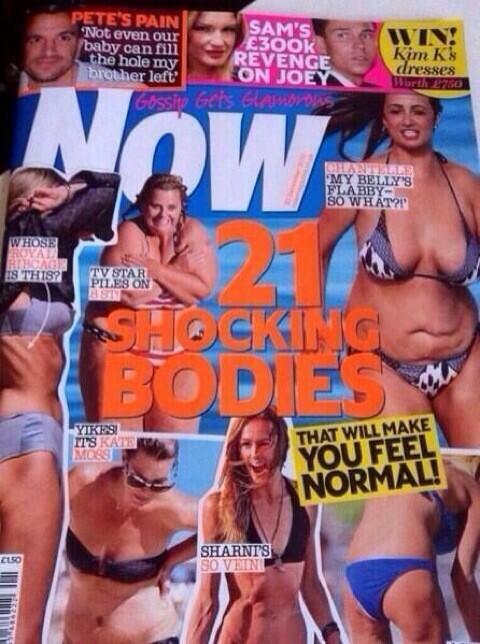 For the media to represent woman as thin or fat, beautiful or ugly is not an accurate representation of our world. Apparently we are only interested in the best or the worst, but the increase is ‘blog’ culture and twitter proves we also have opinions, something to say. It is not just about looks. For my life right now I look nice and average, after my dramas with Breast Cancer and a Brain Tumour returning to looking normal feels great. Everything in my world has more meaning and does not have to be the best, the biggest, the greatest, the newest or most expensive. Well done Pauline Vance-Riggens on mumsnet for starting the debate.